d 1975 hosp. Lawrence, KS b 1823 Madison Co, Mo Mary Louisa Short? b 1832 Tn; d 1882 Ark. b ca1804 Tn, d 1872 Ark. 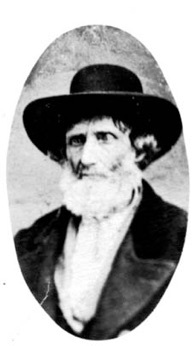 Henry “Harry” Willard was probably born in Virginia about 1760. We don’t know his parents or if he was connected to the English Willards from New England, or the German Willards (Viellards) in Maryland, or other Willards in Virginia. Perhaps only DNA will straighten out this puzzle. A great-granddaughter said she remembers hearing stories of Harry being in the Revolutionary War, but we’ve found no record of it. We do know, however, that Henry married a German girl, Elizabeth “Lissey” Counts (Kuntz) about 1785 in Virginia. Lissey was the daughter of John Counts (Kuntz) and Mary Magdaline Summer. They all lived in the Shenandoah Valley of Virginia on Hawksbill Creek just north of present-day Luray, VA. John Counts bought his farm there in 1765. This area was Shenandoah County (pink on map at right), later put into Page county when it was created in 1831. Settlers were moving into the Shenandoah Valley by the 1730's. Many of these families were German from Phildelphia and Lancaster, Pennsylvania. Some of these were Quakers, who came to the Valley in 1734 and built the Hopewell Friends Meeting near Clearbrook. The Great Wagon Road ran down the Valley along with the Shenandoah River. In 1748 16-year-old George Washington made his first trip into the Valley in Frederick Co, Va. (a little north of Shenandoah Co) with a party of surveyors. He later was elected to the Virginia House of Burgesses from Frederick County in 1758 & 1761. There were not any major battles there in the Revolutionary War, but prisoners were held there. In 1777 Hessian soldiers were held there. Lissey's sister married a Hession POW who was held in the County. About four years after their marriage, in 1787, Harry & Lissey traveled southwest along the Shenandoah Valley (today’s I-81) and then west to the end of Virginia into Russell County (yellow outline), settling there on the Clinch River at Glade Hollow (near present-day Lebanon—red dot on map). This had been a dangerous frontier area with frequent Indian attacks, but was a bit more tame by the time they arrived. 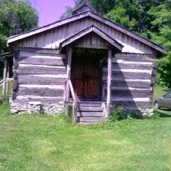 In 1788, the Glade Hollow Fort (on the west side of Lebanon at the big curve on hwy 71) was converted into the Glade Hollow Baptist Church. The church was started and pastored by Rev. Timothy Burgess. Perhaps the family attended here. By 1790 much of Lissey’s Counts family had joined them. Martin was born there in 1793. His brother, Henry Jr was born there in 1801 (along with perhaps 3 girls). See John Count’s farm at Glade Hollow. •Mar 18, 1791 Joseph & Susannah Kiser conveyed to Henry Willard 25 acres on the Clinch River (deed recorded Oct 22, 1791), where Martin was born in 1793. •1795, Henry owned 75 acres in Russell Co, Va.
•Mar 11, 1798 Henry & Elizabeth sold their 35 acres on the Clinch River in Russell Co, Va. to Abraham Childress. Maybe around 1803 after his father-in-law, John Counts, died in Russell County, VA, Harry uprooted his family and moved to northwest Kentucky into Breckinridge County. Martin’s brother, James, were born here in 1804. From the 1810 Kentucky census, Henry/Harry had 8 daughters and 3 sons. In neighboring Hardin County, Thomas Lincoln lived with young son, Abe, but there is no indication they ever met at that time. •In 1805 The Grand Jury returned an indictment on Henry Willard for assault. •In 1807 Henry Wilyard paid a fine for not keeping a road in repair, of which he was surveyor. Making this even more confusing, there was another young man in the county named Henry Willard/Wilyard, who was from Pennsylvania. See the 1810 KY census (p319-ours & 304). It’s uncertain where they lived in Indiana, however, it’s likely that it was in the corridor of Spencer-Perry-Crawford-Harrison counties on the southern border of Indiana. In 1817 a Henry Willard voted in an election in Oil Township, Perry County, IN (if it was this Henry). There are several stories from Martin’s and James’ descendants about them knowing Abe Lincoln, wrestling and splitting rails with him, probably in Spencer County, where Abe’s family lived. There is a question about Abe’s birthdate, which officially is 1809. Some say that he was actually born in 1804-5 in North Carolina, not 1809 in Kentucky, and was the illegitimate son of Abraham Enloe (tall and gangly), not Tom Lincoln (short and stubby). If true, it would have been in his best interest politically and socially to cover up such a beginning, and Lincoln was always reluctant to speak at all of his early family. The “Angel mother” he spoke of was actually his step-mother. Though this story has been hotly debated for 150 years two things make me consider it plausible. First, the minister who married Tom Lincoln and Nancy Hanks in 1806 wrote of a “black-haired boy” with her. And second, this earlier birthdate puts Lincoln closer to the ages of Martin (1793), Henry Jr (1801) and James (1804) Willard for them to have been friends with him between 1818 and 1830 in Indiana. (If Abe had been born in 1809 he would have only been 9-11 in 1818-20 when Martin and James wrestled and split logs with him.) Martin Willard had gone to Missouri by 1821. He seems to have traveled around quite a bit during this time yet kept close ties to his family. It appears that in Indiana at least some of the Willards attended the same church as the Lincolns--Little Pigeon Creek Baptist Church in Spencer County, IN. The pastor of that church (Charles Harper) married James Willard and Rachel Hoover (in July) and also Sarah Lincoln (Abe’s sister, in August) to Aaron Grigsby. Both of these weddings took place in 1826 and are beside each other in the church record book. Harry Willard probably died before 1820 in Indiana. His wife, Lissey may have lived another 10 years. Martin and James were in Cape Girardeau County, MO in 1830 and had an older woman living with them, who may have been Lissey. If so, she probably died in Missouri. Martin & James ended up in Oregon County (southern) Missouri, while Henry Jr. settled in Jo Daviess County (northern) Illinois. There were marriages in Ky/In/Mo for Sarah, Elizabeth, Chrissy and Margaret Willard, all listed as daughters of a Henry Willard. These likely were his daughters (though there were other Henry Willards around). Margaret was definitely one of these daughters. She married Ephriam Greer in Cape Girardeau, MO in 1827. James and Martin were nearby. Margaret and her mother must have gone to Cape with Martin when he went around 1820-30. Eleven? children of Harry and Lissey (Counts) Willard. page 160 - he & his wife were 25-45. Probably had an older woman living with them. 4 boys and 1 girls 0-10. No older children, so this could not be the right family. The possible girls names are taken from various county marriage records. The names in bold I am sure of. 1.Sarah? Willard, b about 1790; Sarah married John Wooten/Woolton. John was next to Henry Willard in the 1810 census in KY.
2.Martin Willard, b 1793, Glade Hollow, Russell Co, VA; lived Ky, In & Mo. Married Mary “Polly” Lindsey in 1821 in Cape Girardeau Co, Mo. Finally settled in Oregon Co, Mo about 1856 where he died about 1865. 4.Crissy? Willard, b abt 1798. There was a Crissy Willard (“daug of Henry Willard”) married Moses Barker, Apr 8, 1813 in Harrison Co, IN. Moses Barker was in Perry Co, IN in 1820. 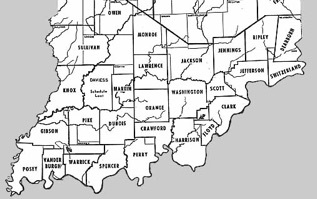 In 1817 Moses voted in an election in Oil Township, Perry County, IN. On the same list of voters was Henry Willard. 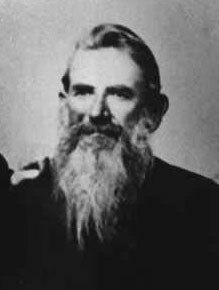 5.Henry Willard, Jr, b 1801, Glade Hollow, Russell Co, Va. Lived in Ky, In, & IL. Married Anna/Annie ? Moved to northern IL, Joe Daviess Co by about 1832, probably to work in the lead mines. He probably died there after 1880. 6.Margaret Willard, b abt 1802, Russell Co, VA. She married Ephriam Greer in 1827 in Cape Girardeau Co, Mo, where her brothers, Martin and James were living. 8. (8-11) There were 4 younger girls on the 1810 census, but I have no name/guesses for them, except maybe Catherine. West Virginia was separated out. For more on Martin, click the “2-Martin” link at the top of page. For more on Martin, click the “2-James” link at the top of page.